Two items on convents: (1) Cities & Virgins (2) Scandal in Naples (contributed by Luciano Mangiafico). "Cities and Virgins: Female Aristocratic Convents in Early Modern Naples and Palermo" by Helen Hills in Oxford Art Journal, Vol. 22, No. 1 (1999), pp. 31-54 Published by: Oxford University Press. These are my comments on a fine essay by Helen Hills in the Oxford Art Journal. It is not an abstract or a synthesis, merely some comments on what I found interesting. It is by no means a substitute for the real thing (for which I refer you to the JSTOR reference, above). Elsewhere I have an entry on the Rebirth of Rome in the Middle Ages. At the time I researched it, I remember being informed of the somewhat helter-skelter approach to the urbanization of the Eternal City. Cities and Virgins: Female Aristocratic Convents in Early Modern Naples and Palermo now make me aware that there were similar approaches in those cities. There was significant building that was not necessarily mandated from the Spanish viceroy at the top; much development in the age of the Neapolitan Baroque started in the middle, at the level of the aristocratic convents, helping to shape the city around them. The author, Helen Hills, asks the question of how female aristocratic convents and the women residing in them contributed to the interplay of the development of the city, architecture, social class, and particularly gender in the development of the cities of Palermo and Naples. She makes the point that the role of gender has largely been overlooked in the history of urbanism—that is to say, gender-specific contributions, not whether there were individual brilliant woman artists or patrons of the arts. Of course, there were, but was the role of women as a class, specifically women in religious houses, different. Her answer is yes. Why? That is the point of the essay. We consider first the session of the Council of Trent (Trento, in northern Italy) in 1563 and the effect it had on women. To refresh your memory, the Council of Trent met 25 times between 1545 and 1563 to deal with the Protestant Reformation; it was the beginning of the so-called Counter-Reformation. In a hurry by 1563, the council left until the very last session the question of women in convents and then dealt with the issue in a very retrograde fashion, reinstating a papal decree from 1298 (almost three centuries earlier!) that women in convents should be strictly enclosed, walled off from the outside world and not be permitted to leave the cloister except in dire emergencies. This set back the tradition of the increasing amount of involvement by nuns in the outside community that had developed over the previous three-hundred years; it ignored the fact that, especially in Naples, the life of the nun was a way for a poor family to preserve its honor—that is, having a daughter active within the church, but not socially isolated from family and community. It was also a way for rich families to avoid paying extravagant dowries when they married a daughter off. She could enter a nunnery instead, for a much smaller “conventual dowry” and still keep her property. …direct architectural results…[it] redirected the energies of some convents from direct engagement with the world through teaching or charitable works, to making their presence felt in cities through building programmes of unprecedented urbanistic and architectural ambition…[This includes]…the effects of such urbanization on both sides of closed doors…contributing to the nature of interior space, its handling, and decoration. Thus, there were not just high walls with rusticated gates on the outside — I love that term…rusticated, made to look rough and sturdy, strong, fortress-like and uninviting!— but, within, there were elaborate portals, narrow stairways, doors, bars, gilt iron grilles resembling cages, all meant to emphasize not just that the sisters were cut off, but to “advertise” that their virginity, their purity, was being protected. For various reasons in Naples, as noted, there were a fair number of women of financial means living the cloistered life. These aristocratic nuns frequently brought property and money to the convent. Some of them had the money to pay for expensive works of art for their religious houses. Hills says, “...Rich families sometimes directed monies towards buildings or decorative programmes for convent churches through nuns related to them…the impact on the convents of an inheritance system…was considerable and it is manifested visually.” In some cases, the wealthy families of nuns funded the construction of entirely new churches with lavishly decorated interiors by the best artisans of the period. Some of the churches cited by Hills as examples of this type of system in Naples are S. Gregorio Armeno, S. Maria della Sapienza, Croce di Lucca and Regina Coeli. The question then turns to how these flamboyantly beautiful convents and churches fit into—indeed, helped to shape—the urban environment and social relations of the day. By 1650 there were 37 convents in Naples, many of them built in the same area in or near the historic center of the city. They gobbled up territory such that few civil dwellings or other buildings existed in their midst. They were so tightly packed that they were like tiny citadels, “conventual enclaves.” Civic buildings, gardens and other public spaces were taken over and, thus, these convents had power to shape the physical domain around them. They dominated streets and squares, and they vied with one another to get the most prestigious worshippers among the noble classes in their congregations. They even sued one another for encroachment! Now something that had not occurred to me. By 1650 Naples was the second most populous city in Europe (after Paris), with attendant problems of overcrowding and lack of hygiene. (That much I knew.) The mushrooming of religious institutions in a city already saturated with them did not help. The author puts much of the responsibility on the desire of the Spanish rulers of their vice-realm of Naples to use religious orders to help combat heresy and public disorder in the face of the recent outbreaks of plague. Public disorder was partially due to conflict at the bottom — Masaniello's Revolt, for example — but also at the top with the desire by the ruling classes to retain feudal privilege in an age when feudalism was on the way out in the face of absolute monarchies. In Naples, feudal lords were ordered to resettle in the city, where the king could keep tabs on them. When the Spanish took over Naples at the beginning of the 1500s, they brought a feudal aristocracy with them. There was then rivalry and conflict at the top, between the old and the new feudal classes. Convents, in a way, became a tool in the battle as more and more noble families sought to retain their wealth by dumping their daughters into convents in order to save paying out dowries to their husbands. There was no such surge in “daughter dumping” among poor families. Hills calls it an “aristocratic solution to an aristocratic problem addressed in religious terms.” At this point, I wonder—and am not really sure—if this "aristocratic solution"—was at least one of the things that extended the life of feudalism in southern Italy. The respectability of the convent is intimately connected to a further aspect of female virginity as representing family honour. Historians and anthropologists studying Mediterranean societies have shown how important sexuality and sexual behaviour are in social delimitation and that it is especially women’s sexuality and behaviour that are subject to control…As the nobility clung to power by increasingly restricting marriage to fewer daughter in each family during the seventeenth and eighteenth centuries, so the regulation of the sexuality of excess daughters became the source of mounting anxiety. And it is above all to the safeguarding of the family honour that the fortress architecture of female convents is conspicuously dedicated. The symbolic meaning of virginity is a source of extreme conflict as one moves from culture to culture in the world. 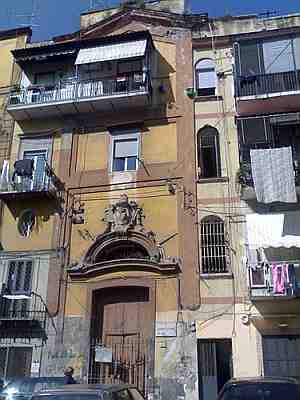 How convent and church architecture in Naples relates to this struggle is interesting. Chosen virginity may be a sign of spirituality within the Christian tradition; on the other hand, imposed virginity presupposes some sort of woman’s guilt, some kind of contaminator of male honour. By willingly populating fortress convents, the women residents emphasized the aspect of choice, and thus the spirituality. Even the high positioning of the nuns’ choir—the space in the church reserved for nuns—in Neapolitan baroque churches elevated those women, physically and spiritually, to special prominence. The architecture of the religious house, itself— the physical shape of the interior—became a tribute to their spirituality at the same time as they were influencing the urban world around them. Read with interest your take on the effect of nunneries on the architecture and urban fabric on Naples. Cooping up so many women in enclosed spaces against their will also had other effects, as evident by the Nun of Monza,* problems within Venetian nunneries, and so on. Naples was not exempt as exemplified by the following, excerpted from one of my own musings. Conventual scandals did not lack in Naples, either. In the 15th century both King Alfonso and subsequently his son, King Ferrante, battled the power and chicanery of monks and the misdeed of nuns with limited success. The writer Masuccio Salernitano (1410-74) in his collection of 50 stories, Il Novellino, described monks and nuns as cheaters, thieves, and fornicators, and states, "nuns are the exclusive property of monks". Monks even tried to cheat King Ferrante by trying to persuade him to persecute Jews by concocting a false miracle by St. Cataldus, but the king got wise to the fraud. 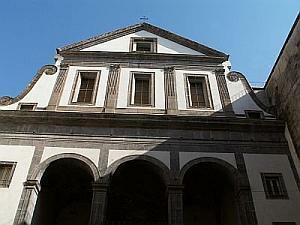 A much worse and violent scandal took place in 1556 in the Convent of Sant'Arcangelo a Baiano, located then near the site of the current central railroad station in Naples. The convent, built in the 13th century by the French Angevin kings to celebrate their defeat of the previous Swabian dynasty, was run by Abbess Laura Baiano and included as nuns a number of noblewomen who had been forced by their parents to take vows. Some were daughters of the most prominent families of the city, accustomed to a life of luxury and good times and were not at all pleased to find themselves locked behind conventual walls, dedicated to a life of prayer and sacrifice. This group included Agata Arcamone, Giulia Caracciolo, Livia Pignatelli, Chiara Frezza, and Laura Sanfelice. The first three listed above were indeed caught sexually entertaining male guests within the convent and were referred to the Cardinal Archbishop of Naples who lectured them and meted a mild form of punishment. Apparently, the girls' families were not so easily assuaged by what they considered slander to their honor and two of the male lovers, Antonio Tarracina and Giacomo Crispo, were murdered by hired assassins. Inside the convent, unknown parties (probably other nuns) poisoned the abbess and two nuns, and the priest assigned by the cardinal to reform the institution, Andrew Avellino (1521-1608; later St. Andrew Avellino), was assaulted and seriously wounded by other nuns' lovers who were no longer able to visit their paramours. As rumors continue to circulate that the nuns were still engaged in sexual orgies, and violence continued to plague the convent, the pope ordered the institution closed in 1577. The convent building, now semi-abandoned, is said to be hounded by the ghosts of some of the nuns, including that of Agata Arcamone, who disappeared mysteriously shortly before the closing of the convent. The church annexed to the convent, St. Arcangelo a Baiano [photo, above], during the troubled times had a reliquary containing some of the blood of St John the Baptist, which had been brought to Naples by the French Angevin kings. The blood liquefied from its solid state each year on June 21, St. John's feast day. When the convent was closed, the reliquary was moved and is now in the church of St. Gregorio Armeno in Naples. Also see how Benedetto Croce tells the story of the scandal.